RAYMOND LUEDEKE was born in New York City. He attended the Eastman School of Music, the Vienna Academy of Music, and Dartmouth College, where he studied with George Crumb. His output is extensive and varied. It runs the gamut from entertaining theater pieces for children, through a long list of sophisticated solo and chamber music to colorful, carefully crafted pieces for orchestra. The striking originality and meticulous craftsmanship of his music have been recognized by numerous grants and awards, among them prizes from the Percussive Arts Society, from the International Horn Society, and from Northwestern University. His contest winning orchestral FANFARE, opened Toronto’s Thomson Hall and his overture THE NORTH WIND'S GIFT was performed throughout Europe in the 1991 tour of the Toronto Symphony. Six Canadian orchestras jointly commissioned TALES OF THE NETSILIK for narrator and orchestra. 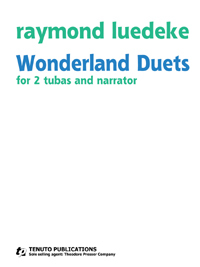 Ray Luedeke is also an experienced librettist. 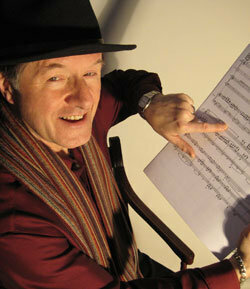 He collaborated with playwright Sean Dixon for his first opera, WILD FLOWERS, produced at The Guelph Spring Festival. Subsequently, he worked with acclaimed director/dramaturge Tom Diamond to write the libretto for his second opera, The Magical Singing Drum, and the script for Into the Labyrinth for two pianos and actor. His most recent "Pocket Opera," I Confess, I Have Lived, was written with famed Canadian playwright Guillermo Verdecchia as dramaturge. In the summer of 2007, Ray started a new music theater company, Voice Afire Pocket Opera and Cabaret, and produced three shows, each reflecting a particular passion of the composer/arranger. I Confess, I Have Lived is based on the poetry of Pablo Neruda. The Pocket Madame Butterfly is an arrangement/adaptation of Puccini’s great masterpiece. Close Embrace is based on the Golden Age of Argentine Tango and reflects the fact that Ray and his wife, Dulce, are avid ballroom dancers. Ray's career includes 4 years as a clarinetist and composer/arranger with the US Air Force Band in Wash., DC, 3 years teaching at The University of Wisconsin - Stevens Point, 2 years as a teaching assistant (freshman composition, electronic music) at Northwestern University (from which he received his Doctorate in composition), 5 years teaching at the University of Missouri - Kansas City, and 29 years as Associate Principal Clarinet with the Toronto Symphony Orchestra. Ray now divides his time between the US and Canada as a free-lance composer and Artistic Director of Voice Afire Pocket Opera and Cabaret www.voiceafire.com/ He lives in Manhattan.